The simple explanation is that they absorb bumps. The not-so-simple explanation follows. Forks, or any suspension, for that matter absorb bumps by allowing the force of the impact to compress a spring. However a spring by itself will release that energy by expanding with the same amount of force. To avoid getting launched into orbit, damping is employed. This controls the rate at which the spring energy is released. This was such a good idea that compression damping is used to regulate how much energy is absorbed by the spring. Damping is accomplished by fork oil and the shim stacks. When the fork hits an object, the energy of the impact is absorbed by the springs. Compression damping regulates how fast this energy is absorbed. This preserves control and prevents bottoming. The key is the oil. In the bottom of the forks there is a reservoir of oil. After impact the fork compresses and shrinks the size of the reservoir. The oil is then forced into the top of the forks. The speed of the oil transfer is regulated by the size of the ports and by the shim stacks. 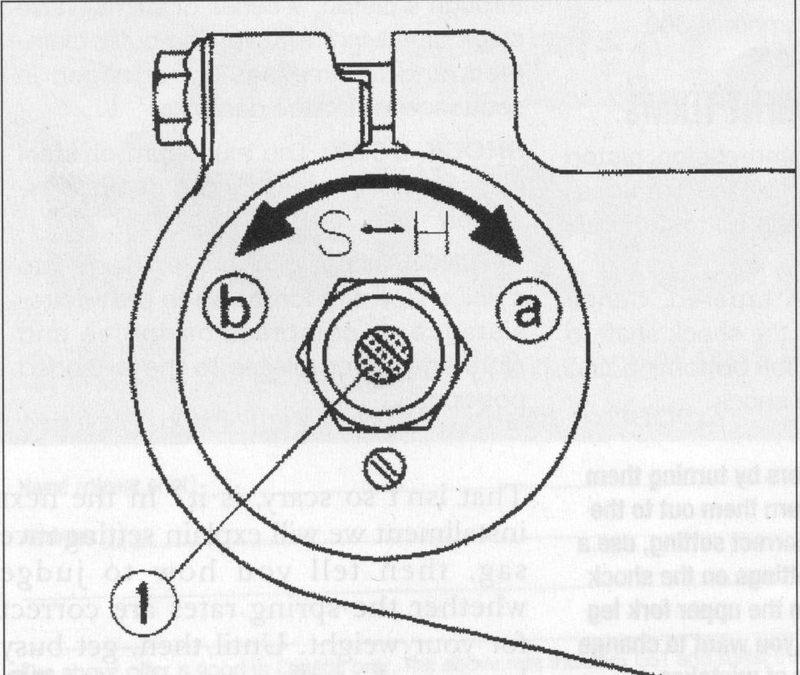 A shim stack is a thin metal washer that covers the port. It takes a certain oil pressure to bend the shim so that oil can pass. When the reservoir is compressed the oil pressure is increased. More compression is equal to more pressure. Compression Adjustment - Front Forks, Top. A undamped spring when compressed will release it's energy instantaneously. The result is comedic unless it's attached to the front end of your bike. The rebound damping allows the release to be controlled. 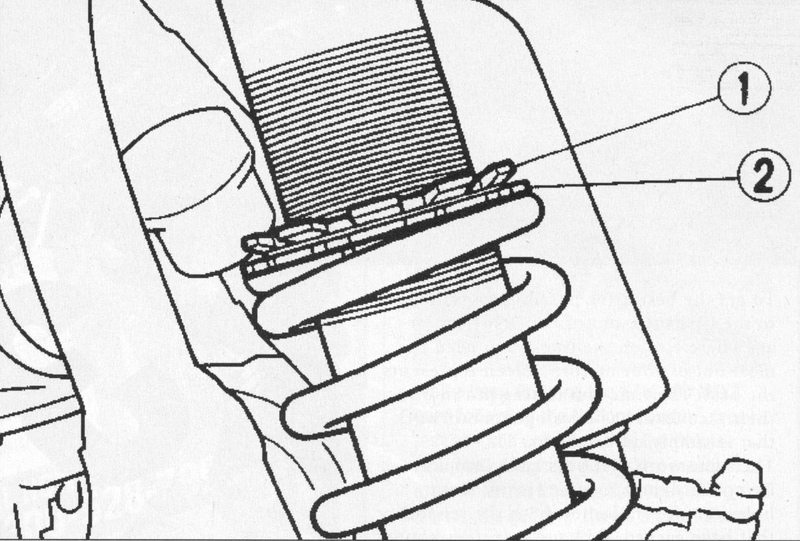 The mechanism is similar to compression damping, except for the fact that now the oil is sucked back into the bottom reservoir as it expands after impact. Few of us like doing this, but it is a necessary evil. 1.) Remove the link bolt that fastens the linkage to the swingarm. This allows greater access to the shock bolt and other link pivot bolts. Watch out for thin shim washers used between the plates. 2.) 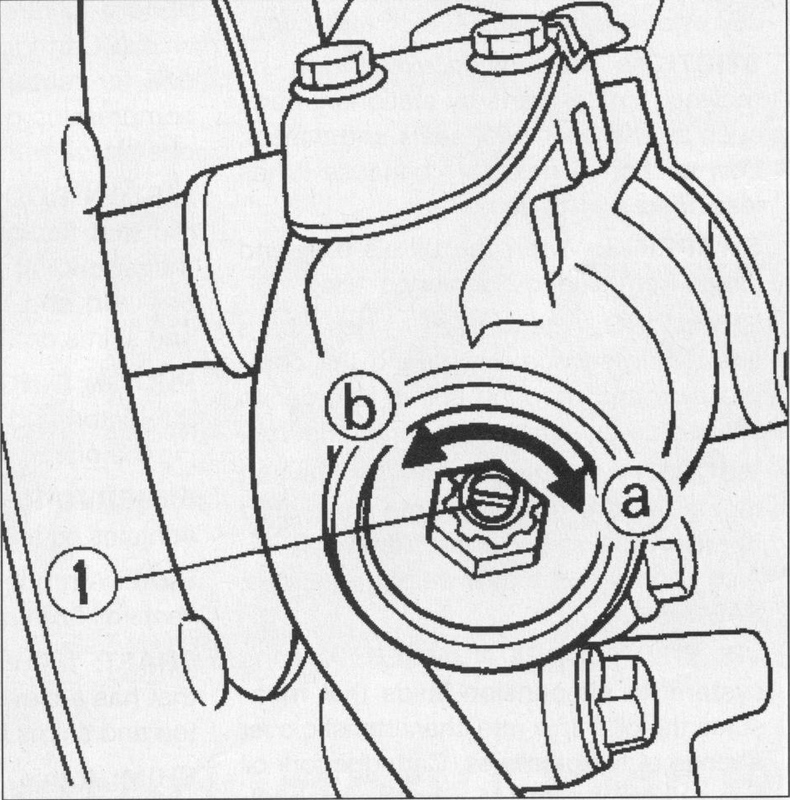 Remove the seals and the bushing from the linkage. Use a degreaser and a shop towel to remove the old grease. If the seals are dry then replace them. If the bushings and bearings are corroded then replace them as well. Use a large C-clamp to push the old bearings out. Be careful with the needle bearings since the only thing that keeps them in is the stiction of the grease. 3.) To get access to the swingarm pivot bearings, pull the chain off the rear sprocket and swing the arm and wheel back.. Remove the seals and bushings and regrease. When you retighten the swingarm bolt then tighten it to the proper torque. Overtighten and affect the suspension damping. Undertighten and the linkage will twist causing premature wear. 4.) Regrease all the bolts before you install them so that they don't seize. Then after installing them, wipe the threads off and apply blue loc-tite to secure the bolts. Wipe excess grease off the outside of the linkage because it will be a magnet for dirt. 1.) Tighten the triple clamp bolts up to the listed torque values given in the manual. Tighten them too tight and the forks will bind as they pass the clamps. 2.) When you replace the front wheel, keep one side of the axle bolts a little loose. Then push the front end down and then tighten down the bolts to torque. This will make sure the forks are aligned. 3.) Put the right spacers in the right spot. If you are missing spacer then don't tighten the axle nut because the forks will pull together.